Google Lunar X Prize contender ARCA plans to land a simple sphere on the moon. FormerX Prize contenders such as the Romanian team ARCA could have called it a daywhen Scaled Composites' SpaceShipOne won the $10 million Ansari X Prize on Oct.4, 2004. Instead, ARCA hopes to build on its previous effort to reach the moonand win the Google Lunar X Prize and even more prize money. "Wehave the experience now, we have the know-how, we have a list of companies thatcan help us, we have connections," said Bogdan Sburlea, ARCA (Aeronauticsand Cosmonautics Romanian Association) project manager. "We already have sometechnology from the previous competition." Thattestedtechnology includes a balloon that can carry ARCA's European Lunar Explorer(ELE) space probe into the upper atmosphere, eliminating the need for atraditional launch pad and allowing ARCA to launch close to the equator from asea platform. The "0" pressure balloon design is similar to a giantblack hot-air balloon that uses solar energy to heat the air inside, instead ofthe burner that normal hot-air balloons use. Oncethe balloon soars above 11 miles (18 km), the three-stage rocket slung belowwill fire and boost itself into low Earth orbit. ELE will then travel to themoon and deploy its Lunar Lander, which resembles a knobby rubber ball thatuses its own rocket engine to ensure a soft landing. TheGoogleLunar X Prize requires teams to land a robot on the moon, move at least1,640 feet (500 meters) and beam high definition views back to Earth. ARCA'sround lander would skim the lunar surface using its rocket engine. Unlikesome teams with plans for lunar roversor crawlers, ARCA sprang for the easiest lunar lander they could design.The team's focus is on getting to the moon, as opposed to what happens oncethey get there. "Ourdesign for the lander is extremely simple, it's a sphere," Sburlea said. "It's too complicated, too expensive to build a robot." ARCAcompleted propulsion tests of its STABILO hybrid rocket launcher in March, aspart of its switch from single propellant propulsion. Team leader DumitruPopescu also suffered health problems that led the team to delay its initial plannedlaunch last fall. Theissue of expense hangs over allthe teams competing for the Google Lunar X Prize. ARCA has lined up privatesponsors within Romania for different parts of the effort, such as fuel andmaterials, and is confident that it can accomplish its goals fairly cheaply. Mostmembers of the ARCA team have volunteered their time for the effort, heedingthe call of team leader Dumitru Popescu to promote Romanian space efforts. Thenonprofit group may not draw much financial support from the Romaniangovernment, but that's the entire point — to blaze the way for futureprivate space endeavors. "Wewon't use $30 million," Sburlea noted, referring to the total awards pursefor the Lunar X Prize. "We know for sure that it's going to be much lessfrom previous experience, previous launches." The$30 million Google Lunar X Prize breaks down into a $20 million grand prize forfirst place, $5 million for second place, and an additional $5 million bonus.By comparison, the Ansari X Prize that ARCA was previously aiming for anawarded $10 million. Sburleasaid he had expected the next X Prize to build on the Ansari X Prize by askingteams to put a man into orbit. 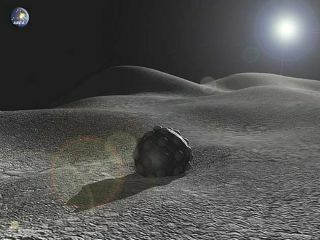 However, he added that the Google Lunar X Prizegoal may actually ease some of the pressure on thecompetitors. "Weare not talking about manned spaceflight," Sburlea said. "Ifsomething goes wrong, so what? Nobody dies."